Offering you a complete choice of products which include automatic sticker labeling machine, automatic double side labeling machine, hand operated sticker labeling machine, semi automatic horizontal sticker labeling machine, semi automatic sticker labelling machine and automatic color box three side labeling machine. Weight Appx 250 to 300kg. 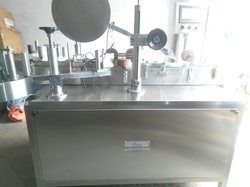 We are the prominent manufacturer, exporter and supplier of Automatic Sticker Labeling Machine.The machine is suitable for pharmaceuticals, food products, beverage, fertilizer and pesticides having bigger label height and length. The machine incorporates latest micro processor control label dispensing system with user friendly sensing system for label and product. Our client can avail these machines at very reasonable price in market. At Ashirwad Labeling Concepts, we have perfected label application with our easy-to-use, dependable hand labeling machines. Since many other labeling machines require electricity and include various complicated components that make use difficult, our hand label machines are the most cost-effective and time-efficient method of applying labels; our affordable line of labeling machine products provide accurate and fast results that you can count on. These Semi Automatic Horizontal Sticker Labeling Machine are manufactured from high grade quality material, and these are available at very reasonable price. The machine is developed for use of the customers requiring lower rate of production for their round bottles/containers, where automatic labelling machine are not economical. No change parts required for label size and product size, the change over time is very less. Our sticker labelling machine has its own unique single point synchronized speed control system. •The unit is made compact & versatile as per GMP norms. •The whole structure is made of SS304. •Rigid vibration free construction for trouble free performance. •Can be operated by semi-skilled operator. •No change parts required for different bottles (Range: 15mm to 90mm Diameter). •The machine can be utilized for various sizes (Diameter) of bottles. •User friendly and very less maintenance required. •All pneumatic components are of FESTO make. •Break assembly to avoid variation. 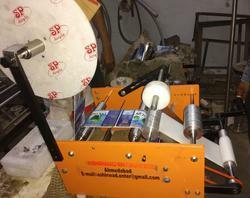 The Automatic Double Side And Top Side Sticker Labeling Machine, is one of the most user friendly. The Machine incorporates latest sophisticated PLC Servo Base Processor Control Label Dispensing system with user friendly Sensing system for Label and Product. 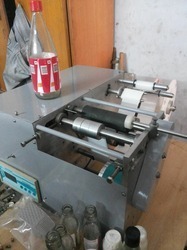 The machine is suitable for three side Labeling on your color boxes. 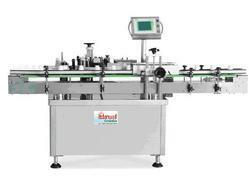 It is capable of Labeling up to 50 per minute depending on bottles & Label sizes. The System thus saves valuable time, avoiding machine-down time, and helps achieve higher production. Machines having required all basic features as a standard fitment to match the current market needs and also saves cost and time. Our machine are highly appreciated by our client due to their best quality and unique design. Our expertise lies in offering an exclusive array of Automatic Vertical Sticker Labeling Machine used for labeling on Vials & small size round Bottles. 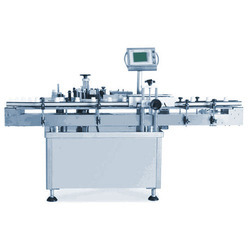 These machines are used for labeling on round vials/bottles, I.V. fluid bottles, jars and tins. Moreover, these are also suitable for varied other round objects such as aluminum, glass, plastic, LDPE, HDPE, PP and PET. We specialize in offering an exclusive range of Vertical Sticker Labeling Machines. These machines are suitable for labeling on round jar, tins, bottles and other round objects of glass, aluminum, plastic, LDPE, HDPE, PP and PET. Our machines can perform labeling up to 150 Bottles per minute depending on product diameter & label size. These machines have got extensive usage in food products, beverage, fertilizer, pharmaceuticals and pesticides, which have bigger label height and length. These are available at very reasonable price in market. 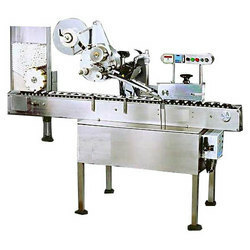 Looking for Bottle Labelling Machine ?